Just one day into Afghanistan's new voter-registration drive, the eastern city of Jalalabad was having problems. Only one UN-run registration centre was open rather than the planned six, mistakes were being made and anger was being vented at the government by the ethnic Pashtuns who dominate the area. It was clear that giving the nation its first taste of democracy in nearly 40 years would be a massive task. Voter-registration centres opened on Monday in eight cities across the country, trying to register an estimated 10.5 million Afghans thought eligible to cast ballots in national elections set for June. But with increasing political instability, a resurgent Taleban and fears of ethnic discrimination, conducting a successful free and fair election is by no means guaranteed. 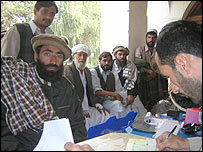 In Jalalabad, registration at the Department of Tribal Affairs was conducted under tight security. 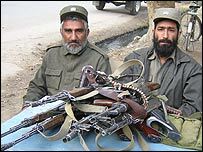 Guards searched everyone who entered; a pile of Kalashnikovs was left at the gate. Within the compound, community heads huddled around the electoral registration desks, waiting patiently for their photograph to be taken. After a few minutes, and some basic questions, a laminated card that will allow them to vote next June, was produced. Mistakes were already being made, revealing a system that is open to abuse. One man was accidentally registered as a resident of Jalalabad, nowhere near his home province in the south. "There's nothing stopping me", he argued, "going back to Zabul and being processed again." On election day, indelible ink, which should last for a week, will be applied to people's fingers, but the potential for confusion is high. The registration process is also giving the Pashtuns, Afghanistan's largest ethnic group, an opportunity to vent their frustration with the central government. The tribal leaders who had squeezed into an "education" tent at the centre were told of political reforms the central government was embarking upon and the opportunities a free and fair election would provide. The leaders listened politely, but seemed unconvinced. One would-be Jalalabad voter, Zia ul-Haq, said: "The Pashtuns don't have enough rights; the Tajiks have all the power in Kabul. "Apart from the president, Hamid Karzai, they are all gunslingers, warlords. We don't respect them. We hope that the election will change things, but fear the same people will stay in control." Jalalabad is only a four-hour drive from Kabul through the Hindu Kush, but it is apparent that much, aside from mountains, divides the cities. Jalalabad is a Pashtun heartland. The bazaar is a male bastion; hardly a woman is to be seen. In this fiercely traditional area, many do not even go out to shop. Nighar Khaliz, one of a handful of local women activists, fears the international promise of universal suffrage is fanciful. 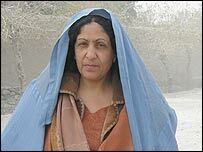 "Not all women will be able to vote in Pashtun areas," she argues. "Just those with broad-minded families will be allowed to. Most are too shy to even tell outsiders their name." The United Nations is undertaking an extensive "civic education" programme to try to ensure all eligible Afghans will be able to vote. But it is clear that any election held in the current security situation will be incomplete, given the violence in the Pashtun-dominated south and south-east. Electoral officers plan to travel by car, plane and even donkey, but the idea that the whole population can be reached within six months is, critics say, fanciful. Regular attacks by the resurgent Taleban movement have made much of the south and south-east off-limits to the international community - a big problem when the UN is in charge of the registration. Christina Bennett, from the Afghanistan Research and Evaluation Unit, a Kabul-based research organisation, fears an early election could further marginalise the Pashtuns. "If they are excluded because electoral teams can't get to them, they will feel even more disenfranchised than they already do," she says. "Whatever outcome the election has will not have the legitimacy, will not have the mandate from the south that it needs in order to be a central government." The chief electoral officer, Professor Reginald Austin, a Zimbabwean who has organised post-conflict elections in Cambodia and South Africa, admits that planning a poll in Afghanistan presents unique challenges. "We hope of course that the international community will take the question of security much more seriously," he says. Can there be a fair election, if the instability continues? "I don't believe there can be," he says. If Afghans are to enjoy democracy, the outside world will have to create the conditions in which it can flourish. For this poll to be truly free and fair, all Afghans must be involved in the political process. The fear is the introduction of democracy to a country that is still not at peace will reinforce divisions, rather than reconcile them.